Now that summer is practically here, more and more people will be participating in outdoor sports. A lot of people enjoy soaking up the suns rays while waterskiing, playing frisbee at the park, or another fun activity where they can get the whole family involved. Unfortunately, taking part in these athletic activities increase your chances of suffering from a dental emergency—one that can knock a tooth out! Your dentist wants to emphasize the importance of wearing a custom mouthguard from Darby Creek Dental. These specialized devices are used for protection against blows to the face and head. 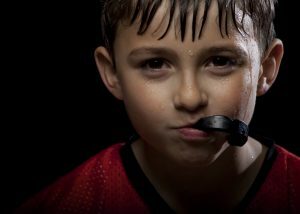 These custom mouthguards should be considered critical pieces of athletic equipment, especially for anyone participating in a sport that involves heavy bodily contact, falling, or equipment. If you or a loved one plays football, basketball, baseball, soccer, hockey, gymnastics, skateboarding, or even cycling you may need to consider getting a mouthguard to keep your healthy teeth and gums safe. Even for athletes in the summer that just enjoy water sports! This is especially important if you have had prior dental work done or currently are undergoing dental treatments like traditional braces. Wearing a mouthguard with braces can save even your lips and cheeks from being injured from the combination of a hard impact and the unforgiving metal in your mouth. If you’re thinking of getting a custom mouthguard from your cosmetic dentist in Marysville, that’s already a great step in protecting your teeth from extensive damage. But before just running to your nearest drugstore, it’s important to weigh out your options: custom mouthguards vs. store bought mouthgaurds. It may seem easier to just buy a “one size fits all” mouthguard from your local sports store, but customization has many advantages. Create a buffer between the soft tissues of the lips, cheeks, and teeth. Prevent tooth fractures or dislocations by redistributing the forces of impact. Supports jaws with increased support and stability. Provide positive reinforcement in preventing neck injuries. Provide psychological benefits to athletes—allowing them to be more confident and aggressive while playing sports. When you choose to get a custom mouthguard from Darby Creek Dental, you should have protection for your teeth for the whole season, if not longer with the proper care. It’s vital to remove your mouthguard to rinse and clean it when called for. Typically, during your routine dental checkup, one of our dentists will be able to discuss whether creating a new mouthguard is necessary while he checks on the rest of your dental health (sometimes your mouth’s alignment will change or develop overtime). Our office loves to treat our athletic patients—both young players and professionals alike—with great preventive care. Call our office today to help protect you or a loved one from potential dental injuries.